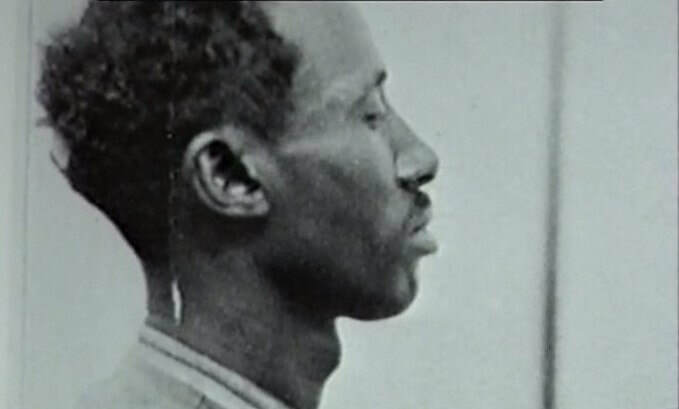 The story of a man wrongly convicted for murder, and executed for the crime in September 1952. Mahmood Hussein Mattan was born in British Somaliland in the 1920s. It is likely that he first came to Britain while working on board one of the many ships travelling from Africa and due to employment opportunities in the maritime sector decided to stay. By the mid-1940s, the Somalian seaman had settled in Cardiff. In 1945, Mattan met his future wife, local woman Laura Williams. One day while she was on her way to work, he approached her and asked if he could take her to the cinema. Laura agreed but with trepidation as she was from a white working-class family that lived in the suburbs of Cardiff and believed her mother and father would have disapproved of their relationship. However, they quickly fell in love and two years later the couple married. After their wedding, they looked for a place to live away from the docks, but no landlord would allow them to reside together which meant that Laura had to remain at home and Mattan in his lodging house. Despite racist views and the obstacles which the couple found continuously put in front of them, Laura and Mattan had a loving relationship and stayed together. Laura, Mattan and their family were definitely living in Cardiff by early 1952. They resided in a house in Davis Street where they were continuously ridiculed for their interracial marriage. It was during this time that their lives would change forever. 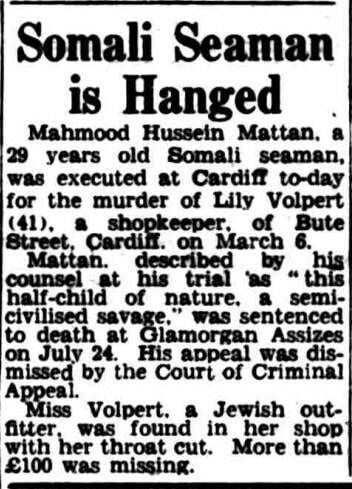 On 6 March 1952 at 8pm, Lily Volpert, a Jewish shopkeeper and unofficial money lender in Bute Town, Cardiff was murdered. Her throat was slashed with a razor and £100 was stolen from her premises. The police were pressured to act quickly and within a couple of hours they were reportedly looking for a 30-year-old Somalian man after they had been given an eye-witness statement from Jamaican carpenter, Harold Cover reported that he had seen Mattan leaving Volpert's shop around the time of the murder. Cover became the chief prosecution witness and was a central figure in the case, although he could only provide weak evidence and possibly had his own motives for accusing Mattan of the crime. Approximately, a week after the murder, the Volpert family offered a £200 reward for information. This prompted notorious police informer, May Gray, to come forward and report that Mattan had entered her shop and produced a bundle of cash which he said was to buy second hand clothes. She insisted this was out of character for the Somalian as he was usually short of money. While in police custody Mattan featured in at least two police line-ups in which none of the Volpert family picked him out. A 12-year-old girl also came forward to report that she had seen the victim answer the door to a Black man with a moustache after the store had closed at 8pm. This man once again did not match Mattan's description as he was always clean shaven. She later gave evidence that when she went to Cardiff Police Station to try and identify the attacker in an identity parade, Mattan was the only man there. She told the Police that he was not the man she had seen but the they dismissed her, and her evidence was not passed to the defence. It would seem they had made up their mind that Mattan was guilty. Coventry Evening Telegraph, 3 September 1952. Sadly in 2003 Omar Mattan was found washed up on Murkle Beach in northern Scotland at the age of 53 years old. Although he had been drinking there were no suspicious circumstances. It is his brother Mervyn's belief that his death and his life was marred as a result of the miscarriages of justice and the racism their family suffered. His mother Laura Mattan died in 2008 aged 78 years old. Hear Laura and Mahmood's friends speak about him in a video on the case. 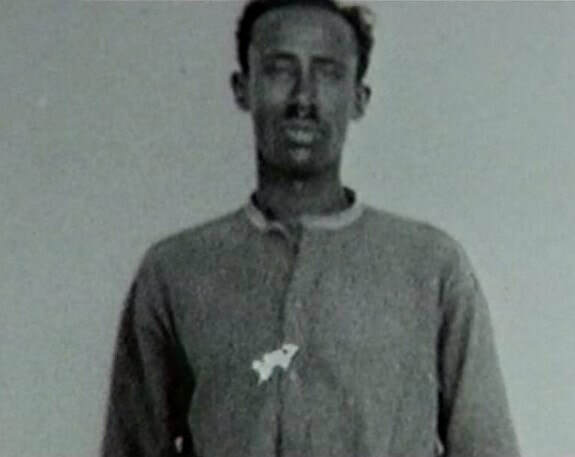 There is some disagreement about his birth year, some reports advise that Mattan was born in 1924, but his family insisted that he was born four years later and had lied about his age while in Somalia, so he could go to sea. Natasha Narayan, The Observer, 2 June 1996. Portsmouth Evening Post, 17 March 1952, p. 1. Somalia online, https://www.somaliaonline.com/community/topic/8783-mohamoud-mattan39s-misscarriage-of-justice-alla-yarxama/?tab=comments#comment-125165 accessed 16/04/18. Serious doubt has been cast over Cover’s accounts of that evening as seventeen years later in 1969, he was sentenced to life imprisonment for attempted murder after cutting his daughter’s throat with a razor. Birmingham Daily Gazette, 11 March 1952, p. 1. Coventry Evening Telegraph, 29 July 1952, p. 9. 2 September 1952, p. 3. The Independent, https://www.independent.co.uk/news/so-who-is-the-real-killer-of-tiger-bay-1234073.html accessed 18/4/18. Birmingham Daily Post, 13 June 1969, p. 12. The Guardian, https://www.theguardian.com/uk/2003/aug/03/race.world accessed 18/04/18.